" Charity " is the highest level of morality to describe a traditional Chinese Taoism. Taoist concept watch , the water is wise , humble , tolerant and pragmatic symbol. 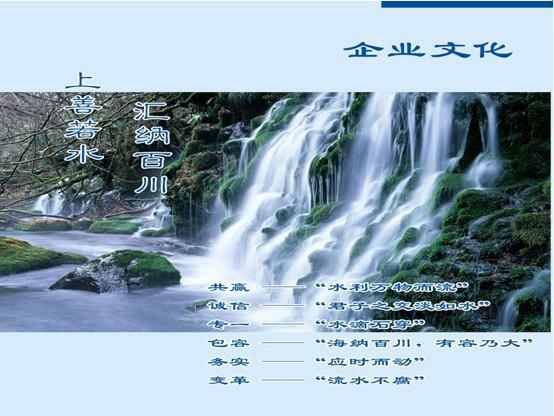 This is my company wants to water as a warning, repair s minds , Gordon Road from the world of culture . Water , " which benefits all things without struggle " ; water, invisible inaction , with the shape and change, Wenliang Qian make ; water, Zhirou , nourishes all things , run of things , rather than quarrel with all things . Enterprise is based on the needs of the community , as all things are inseparable , like water , if the company does give social and public benefits , then the community and the public on the need for our business to exist, we have a foothold in the enterprise land. Therefore, enterprises have to consider is how to meet the general needs of the community and the public. Water, but their inclusion, they are able to exchange one thousand rivers flow together ; provided they are humble , they are able Carolina rivers from the sea. " Be tolerant to diversity , tolerance is a virtue ." Enterprises should also have a quality of tolerance , broad-minded , to be able to contain all aspects of talent , good listen to various opinions and suggestions. To be able to have a guest, short , guest, long, guest, too , can be a guest, magnanimity , recruit more capable , so the talent pool like the ocean power savings , when the time comes, it can be overwhelming, blew out . Water , not just static , low , change, also implies a move, boast , Kennedy . Lake like a mirror , but in reality vitality ; gurgling streams, but in reality innumerable twists and turns ; rivers east death , but in reality the great tide . Development of enterprises, to adhere to innovation, and continuously forge ahead, like water in a calm and always maintain the vitality flow. Enterprises in the development process will inevitably encounter various difficulties and obstacles , this time you need to have the spirit of dropping water , the softness , tenaciously . Water , a symbol of pure and clear , charity, begins with " Suffering " line in the " indifferent ", but finally " proudly ." Enterprises should also water -clear magnanimous , open and aboveboard , do you want to abandon the enterprise solely for the selfish narrow ideological profitable , always keeping in mind social responsibility , do not insult the sacred mission of national enterprises , will benefit the health of people's lives as the eternal pursuit of business objectives !